Ամեն օր վաղ առավոտյան զբոսնում եմ այս այգում՝ ներշնչվելով աշնան անզուգական գեղեցկությամբ: Լուսանկարն արել եմ՝ նոյեմբերի 1-ին, 2017 թ. 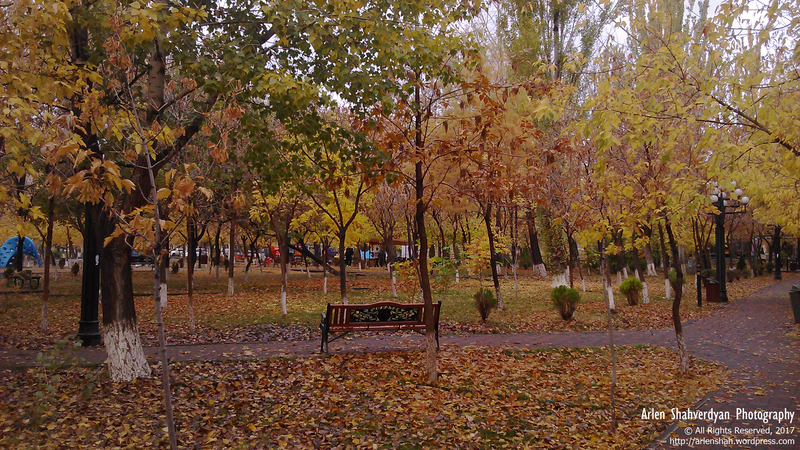 / Every day early in the morning I take a walk in this park, inspiring by the beauty of Yerevan autumn. The photo is taken by me on November 1, 2017. To my foreign Readers – Dear all, I have the honor to introduce to you my new poem “Yerevan Autumn” (written on 01.11.2017). As always I tried to translate the poem for all my foreign readers. The following is a literal (word for word) translation of the poem, trying to make the meaning of the poem more understandable and available for all. While inside me there is a golden carpet, made from leaves. When singing Autumn with the Poet’s pen. And the air mix of the wet smells. Which is turning into a dancing melody. But I have seen Autumn only here. Dear friends, it is my pleasure to introduce to you my last drawing, which I drew on October 30, 2013, with one usual black pen. I hope you will like this drawing of an African black maned male lion. Dear Friends, today in 15-20 minutes I drew this Leopard by pen. I hope You’ll like it. I also decided to open a new Category “Իմ նկարները / My Drawings” (see in Blog “Categories”), where I’ll post My works drawn by pen or pencils. The Drawing is Copyright protected.